Skylar came into our rescue because her family did not take her to the vet when she was having issues delivering her babies until they were all dead. Once he found out he could not make any money from her, he no longer wanted her. We were contacted and immediately agreed to pay to saver her life and bring her into our rescue. Skylar is currently in an Amazing Foster Home and is doing so well. 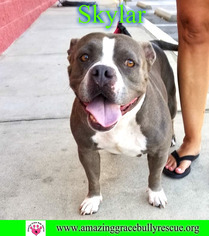 Skylar is a short, stocky, female blue brindle and white American Staffordshire Terrier who is about five years old. She is completely potty trained, crate trained, and leash trained. She is a very sweet girl and is living with a puppy that was recently adopted from us and doing very well. If you would like to add this beautiful girl to your family and already have pets, we recommend careful, slow introductions because we do not believe this girl has been properly socialized before we got her. Amazing Grace Bully Rescue is a foster based rescue in the Pensacola, Florida area. We do not have a physical building. If you would like to meet any of our pups, the first step is to fill out our online application so we can contact you. Our adoption fee for Skylar is $150 and includes her spay/neuter, current shots, and microchip. 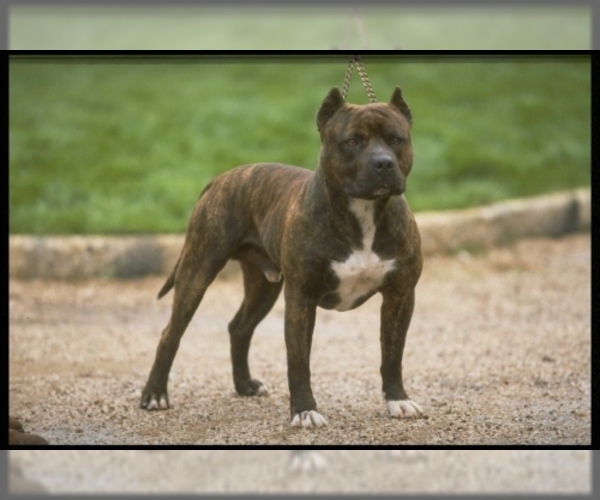 If you would like to adopt this Amazing dog, please fill out our online adoption application at .amazinggracebullyrescue If you have any questions, feel free to call/text us at (850) 723-2037.